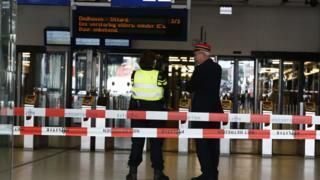 An Afghan man accused of injuring two people in a stabbing at Amsterdam's central railway station on Friday had a terrorist motive, officials say. The man, who has been named in Dutch media as Jawed S, was shot and wounded by police during the incident. Earlier the US ambassador said the two victims were American tourists. "We are aware that both victims were US citizens and have been in touch with them and their families," Pete Hoekstra said in a statement on Saturday. The authorities said: "Following an initial statement it has emerged the man had a terrorist motive." German police have conducted a search of the suspect's home in Germany. A police spokesman quoted by Agence France-Presse said the arrested Afghan man did not know the victims and had not singled them out specifically as targets. The attacker and victims were all taken to hospital for treatment. Some train services in and out of the station were suspended during the incident and two platforms closed. The Central Station is used by an estimated 250,000 travellers every day.